Doodlebug Design Inc Blog: So Thankful Layout.... What are you thankful for? Here at Doodlebug we are thankful for our fans, for color and for beautiful projects. Thanks to our amazing Design Team we wanted to share what they're thankful for and we're kicking it off with Mendi's beautiful layout. Hello Doodlebugs! It's Mendi here today with a layout sharing everything I am thankful for this year using Doodlebug's darling Happy Camper and Friendly Forest collections. I just love the way these two lines mix and match--It's like one giant collection of Doodlebug goodness! To create my background I was inspired by a sketch (which I'm unable to locate to give proper credit) featuring 16 die-cut hearts. I sized each of my hearts to be 2-1/2 inches wide and then set to work embellishing each one with similar tone-on-tone colors and adding a little something I'm thankful for to each. For my journaling I adhered Doodlebug's new cardstock colors, cut into 1" strips, onto a piece of printer paper using scotch tape (already printed once to see my word placement) and then printed everything out again in one pass. I then was able to use my trimmer to cut them down into smaller strips while they were still all attached to the larger paper. It made it super easy! I hope I've inspired you to create your own Thankful" project using these darling collections. Make sure to share your completed projects over on Doodlebug's facebook page and keep checking back for all the amazing ideas my fellow teammates have up their sleeves. Beautiful Mendi!!! Love the hearts!!! What a precious page! I am thankful for my sweet little family! Wow! I am so glad to see a Thanksgiving layout! there was too much winter happening on this blog! I love the idea, and I love how you use all of the doodlebug papers. the owls on the hearts! I love it, everything about it! Such a cute layout, love the paper and colors. I love all these hearts with the cute critters in them! Lovely photo and layout Mendi!!! 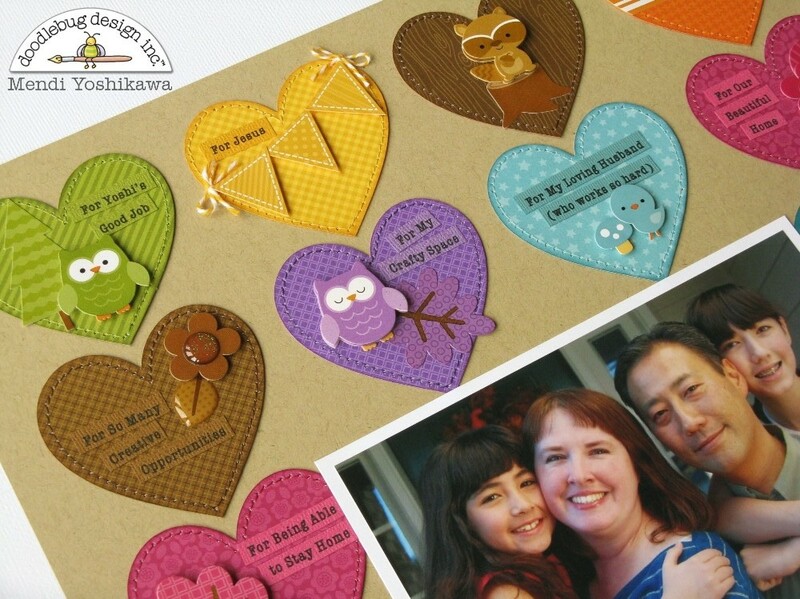 LOVE your pretty stitched hearts - you're so right, the papers mix & match perfectly!!! What Fab & Fun LO!! OMG what a super clever and creative idea I love....love.....LUV!!! Wonderful! Such a great idea for sharing all the ways you are blessed! All with sweet Doodlebug papers and images! Thanks you so much for sharing! So cute, Pinned all three images! This is gorgeous, I love it Mendi. Super well done - gorgeous colors - amazing idea - and Just so typical of Mendi's amazing style!! Way to go Mendi!! !